Jay Pritzker Pavilion is one of the most popular destinations in Chicago for a dizzying array of free cultural performances. It is a gracious host to audiences who come to enjoy its annual Summer Music and Film Series, as well as Gospel, Jazz, Blues, Mariachi and World Music Festivals, Chicago Jazz Philharmonic, NPR’s Wait, Wait, Don’t Tell Me, Broadway in Chicago, Lyric Opera and Grant Park Music Festival. Designed by Frank Gehry, the Jay Pritzker Pavilion stands 120-feet above ground, with a billowing “headdress” composed of individual brushed stainless-steel ribbons that frame the stage opening and connect to an overhead trellis of crisscrossing steel pipes. The stage area of the Pavilion is sheathed completely with Douglas fir and features a series of portable risers and a choral terrace that can accommodate up to a 120-member collective orchestra and choir. Large glass doors that can enclose the stage area when shut, allow the Pavilion to be used during winter months for an assortment of public functions such as banquets, receptions, and lectures. An additional feature is a system of decorative colored lights that when projected onto the proscenium, transform the face of the Pavilion. The trellis of the Pavilion supports an aerial sound system which spans the 4,000 fixed seats and the 95,000 square-foot Great Lawn accommodating an additional 10,000 people. This state-of-the-art sound system, the first of its kind in the world, was designed to mimic the acoustics of an indoor concert hall by distributing enhanced sound equally over both the fixed seats and the lawn creating the effect of reverberation. 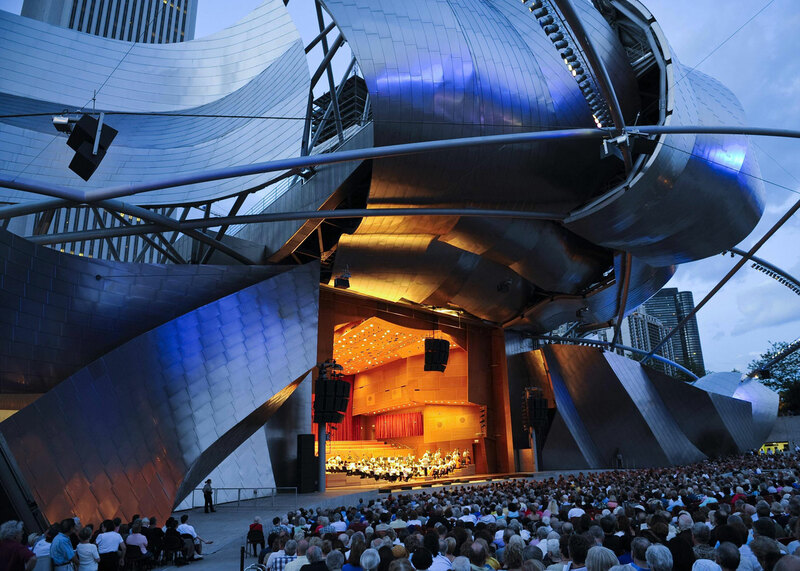 The cost of the Jay Pritzker Pavilion was completely underwritten by the Millennium Park Foundation using funds from private donors. Frank Gehry is an award-winning architect based in Los Angeles, California. Born in Toronto, Canada, Gehry has spread his signature Deconstructivist style in all parts of the globe. Visit Chicago Public Library for more archival photos of Jay Pritzker Pavilion. Michigan Ave. & Columbus Ave.
Download our app for more information and tips for your visit. For more information on events, tours, activities, and more, please visit the City of Chicago website.